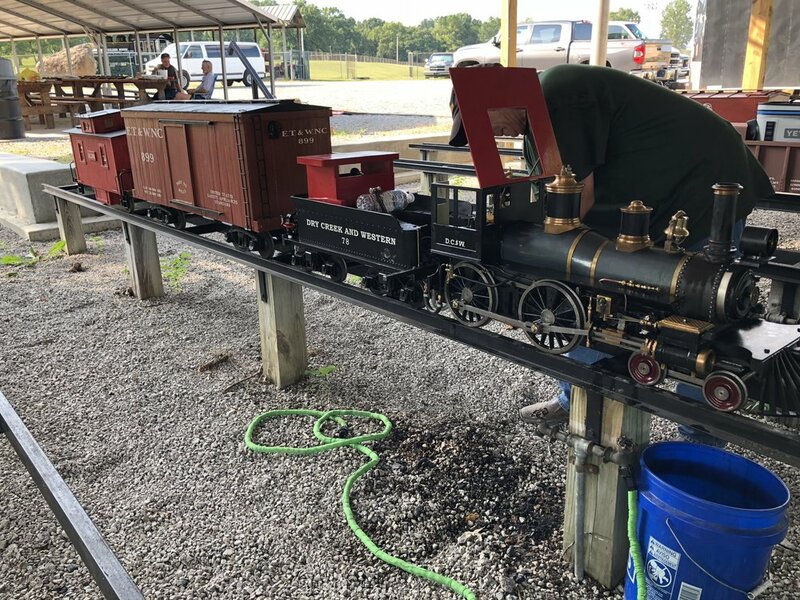 After a lot of work, the new steaming bay yard and siding are finally all put back together. Over the next few work days, the main focus will be getting all this track graveled and leveled in preparation for the Spring Meet. With absolutely amazing weather today, track crews got a lot of work done. The first task was to complete the yard track installation. This went very smoothly and was accomplished very quickly. 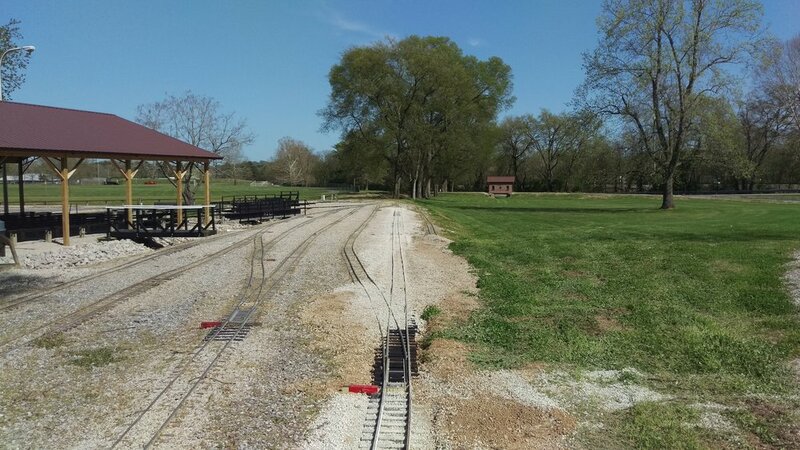 After that, we started to work our way down the track toward the steamer’s pull threw sidings. 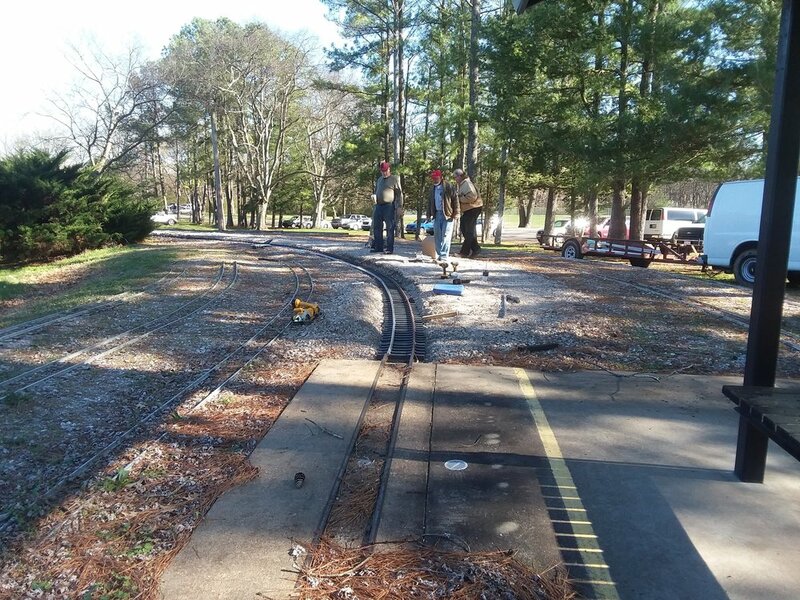 After that, work began installing the water lines on the pull threw tracks. At the same time, others were working to cover the trenches of our new electric lines in that area. Progress continues on getting the new storage building ready for use. When the club received the building, there was no electrical outlets and the light fixtures needed some attention. Once the fixtures were re-wired, new LED bulbs were installed. The new bulbs provide a lot of illumination and make it easy to see everything in the building. An exterior light was also installed to help light up the area during the meets. The other project of the day was installing some lights on both ends of the caboose. 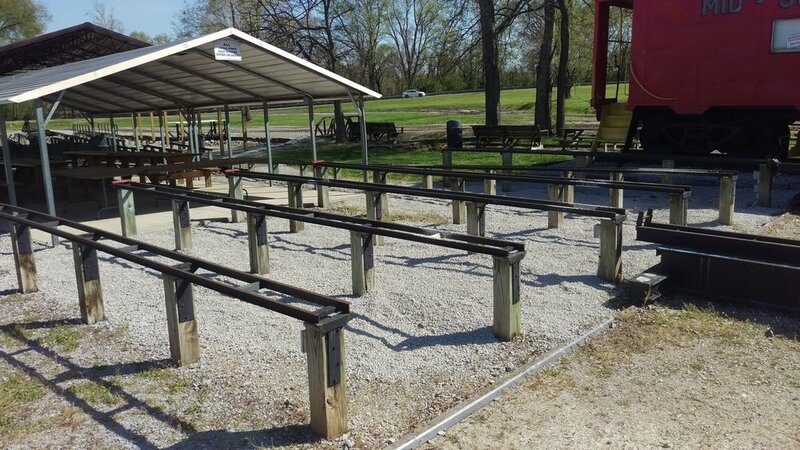 Last summer, new flood lights were installed on top of the caboose to illuminate the loading / unloading area. 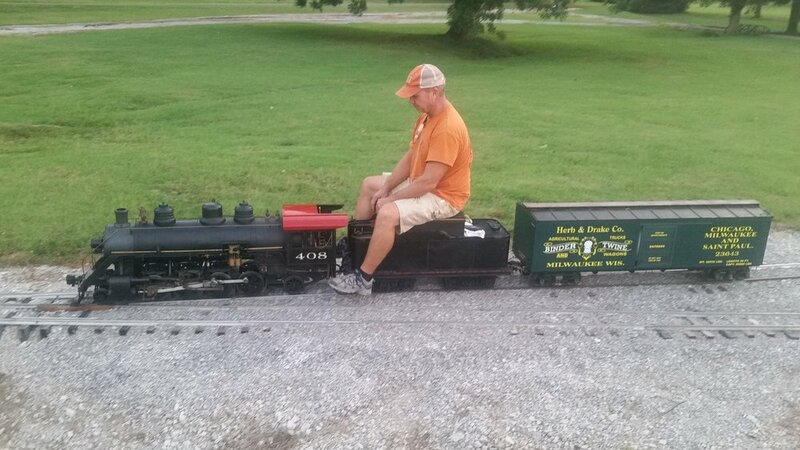 These lights work really well but don’t reach the ends of the caboose. There have been a few instances where members can’t see the stairs if it is dark. There should help correct that issue and make the caboose even more impressive at night. With unusual weather approaching 55F for a few days, a work day was quickly organized. The club rented a ditch witch for the day so underground conduit could be installed. Everyone enjoyed the warm weather and a lot of work got completed. There is a lot more work that needs to be completed before the meet, but good progress is being made. Huge thank you to MSLS member Bill Gardei for building some steps for the new building!! Great progress was made at the workday getting more switches refurbished for the steaming bay yard project. The weather forecast called for rain but it stayed dry and warm all morning. 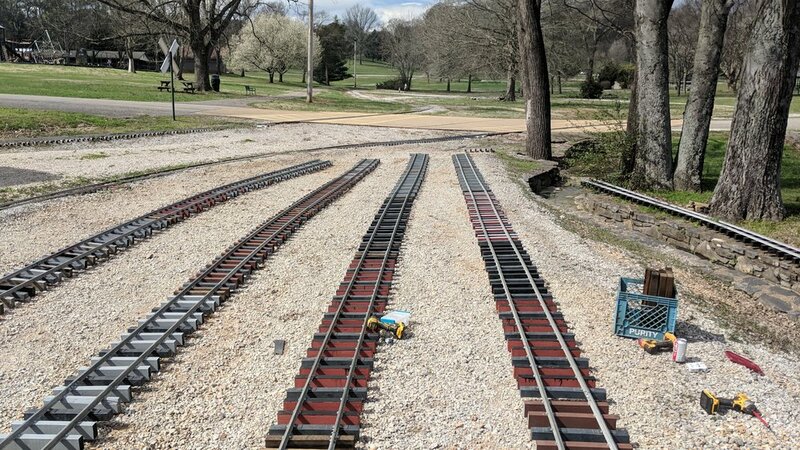 Everyone worked really hard and now all the track elements are built and ready for installation. Over the past week, a work crew has been onsite excavating the steaming bay yard. It took a few days and some heavy equipment to complete this task. The work crew asked not to be named but we are very thankful for the awesome job they did! Although it was cloudy and rained slightly at times, the track crew was able to disassemble around 60 old track panels today. It was a good team effort and now we can focus on getting the rest of the switches refurbished for the steaming bay yard project. With good weather and a great work crew, the first phase of the steaming bay yard rebuild is underway. 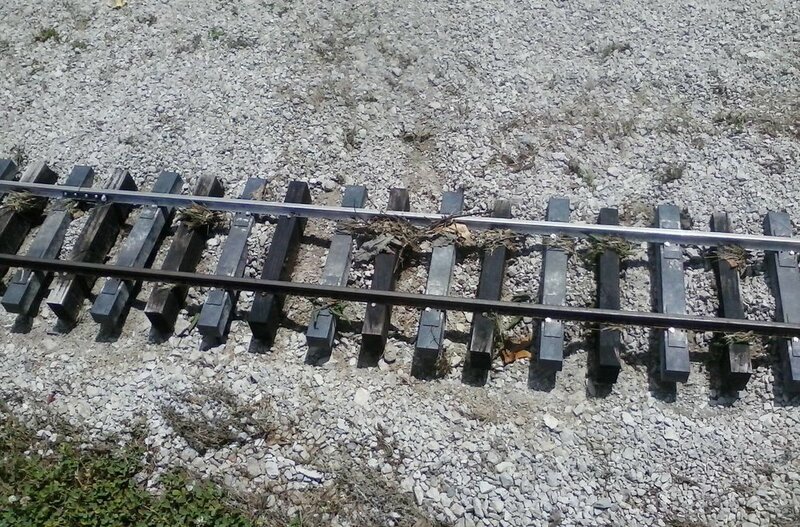 The first task today was to remove all the old track and switches. After that, the work crew began rehabilitation of the old switches. 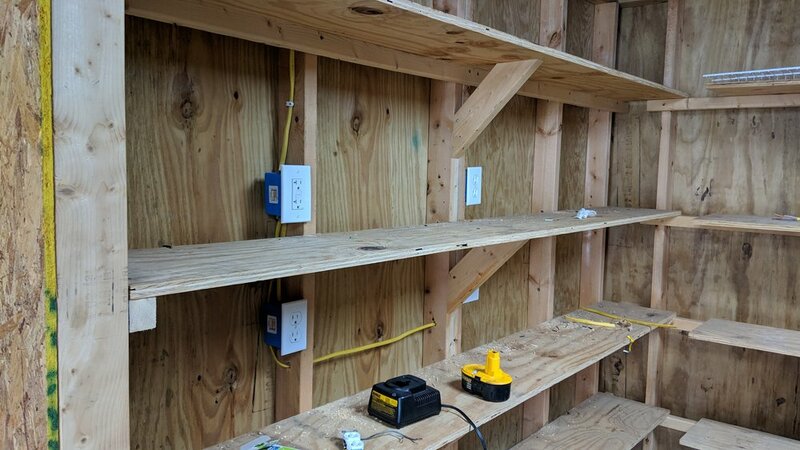 We were able to rebuild 50% of the switches and will work on the other half over the next few weeks. 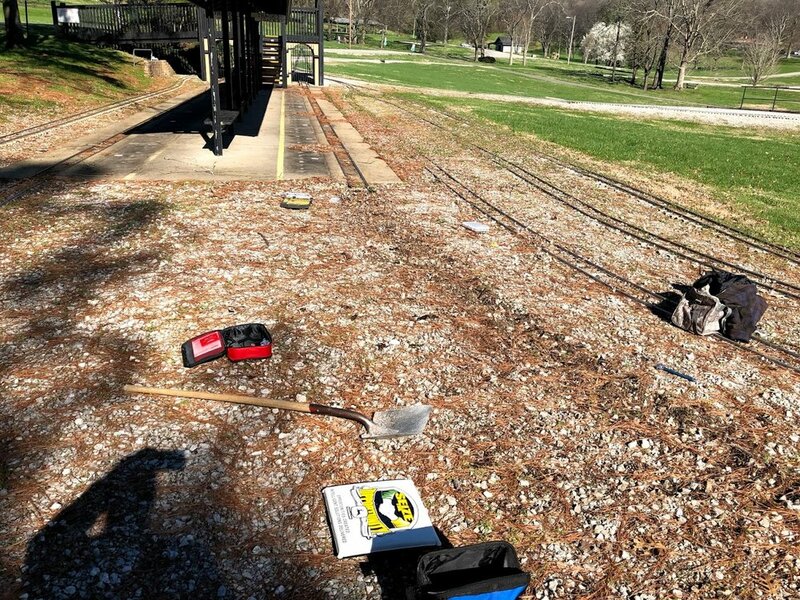 Here are some photos of the amount of track that was removed today. 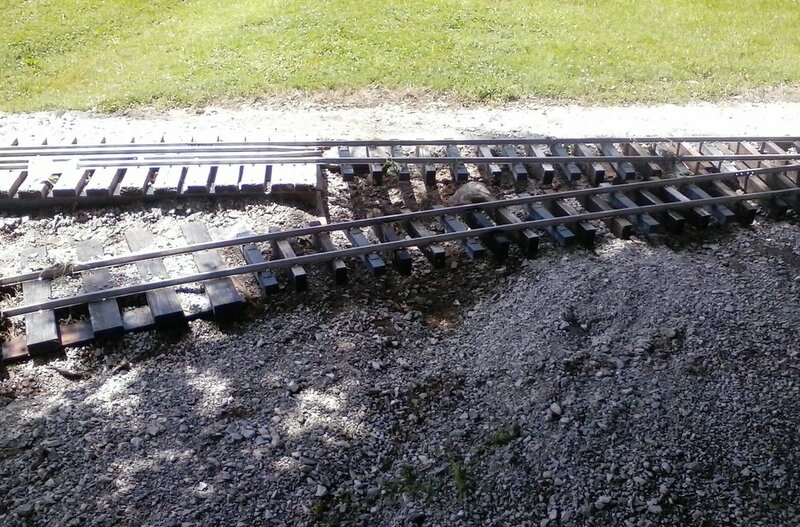 Next week, the track crew will begin to dismantle the old tracks panels. With the Fall Meet only a few weeks away, the track crew is in high gear to complete all the remaining track work projects. 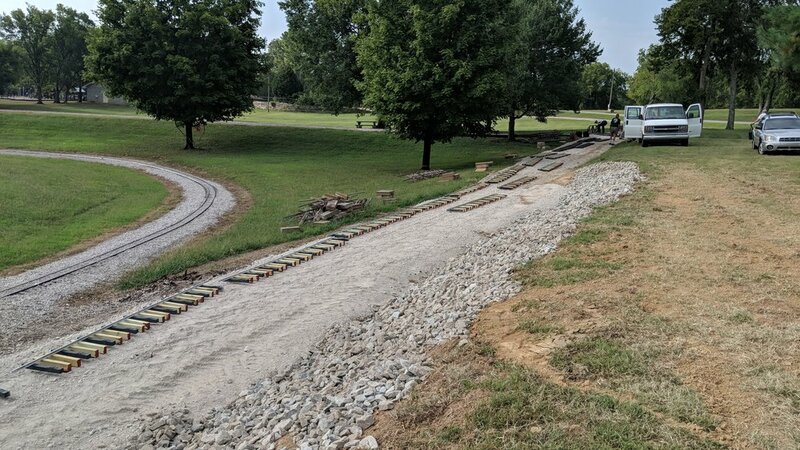 There were two gravel trains running Saturday to bring all the rock needed to finish this section of track. It has taken almost a month to completely rebuild this section of track due to all the roadbed changes but the effort has been well worth it. 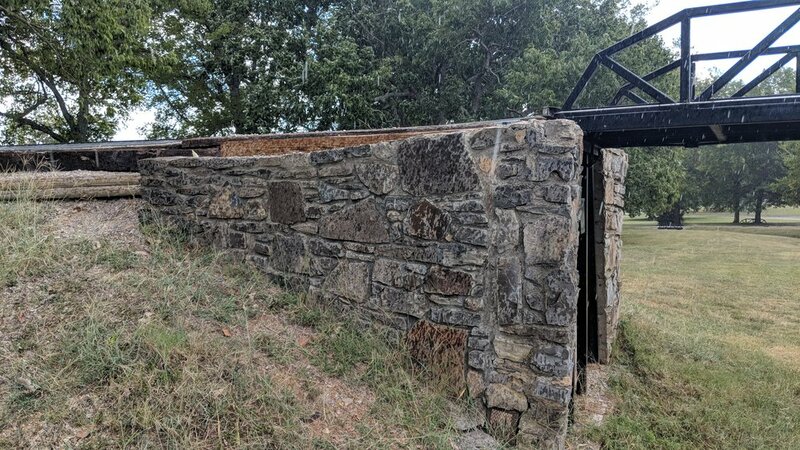 Back in 1992, Maury County Parks & Recreation began installation of some rock retaining walls and culverts around the park. The rock around our bridge was in very bad shape. After meetings with the park management team, we felt the best and safest thing to do was to have a professional fix this wall. Turcios Masonry INC. has just completed a rebuild of those walls. 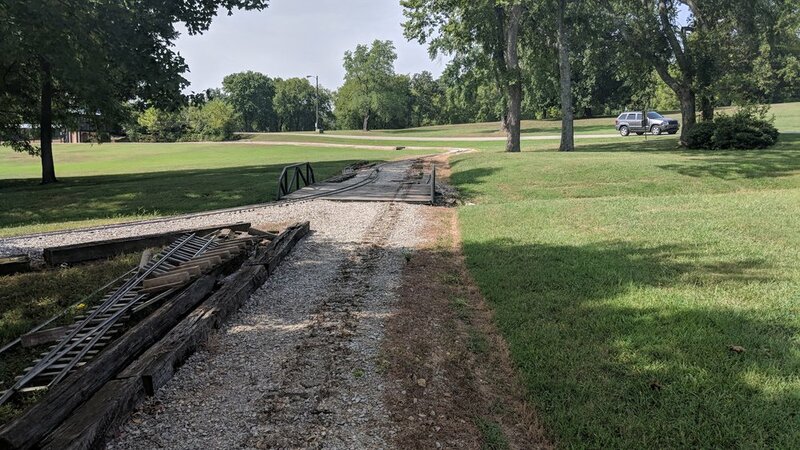 Huge thanks to Maury County Park for helping to fund this repair. 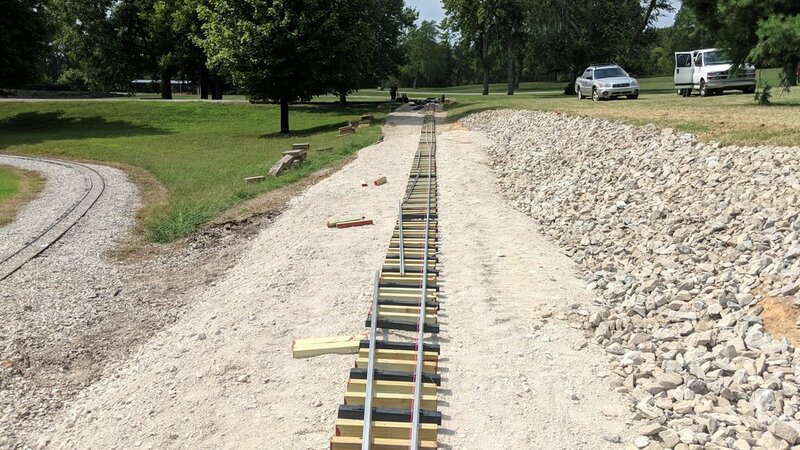 It was a great but hot workday as the track crew installed the new downhill track from the gauntlet to the triple bridge. Over the past 7 days, various members have been onsite preparing the grade and improving water drainage in the area. Over 30 panels were installed as well as new wood decking on the bridge. There is still more work to complete in that area before the project will be complete. Many members came out to enjoy some late afternoon and night running that the track. It was a warm afternoon but as the sun went down, temperatures got a little better. Everyone had a lot of fun and glad so many members were able to attend. On June 28, 2018, Columbia had a major thunder storm and flash flooding affect many areas. Due to the volume of water in such a short amount of time, there was some gravel washed away during the heavy rain. Most of the damage seems to be confined around the creek that runs through the center of the layout. The track crew is currently working on getting tools are resources together to repair the damage in the coming weeks. It was a hot day but many members came out to the annual backwards run day. 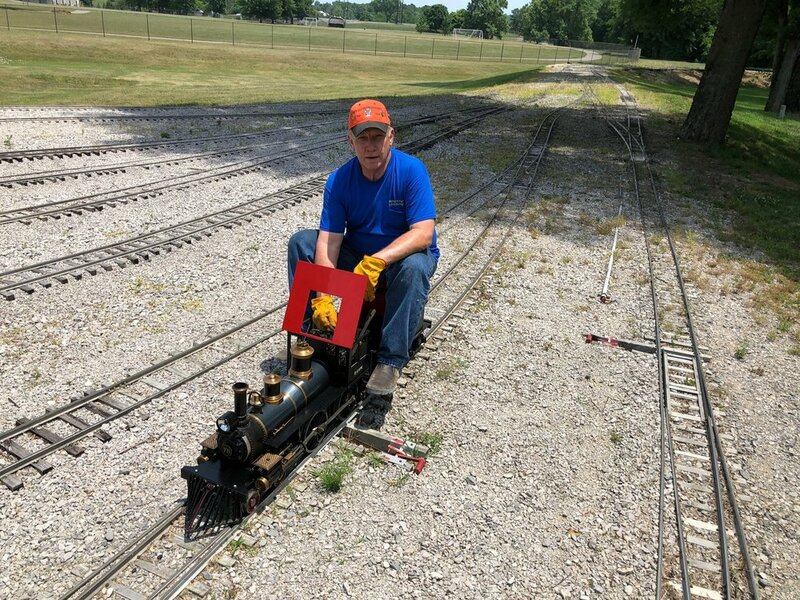 It is truly a unique experience to run the track backwards and creates some unique challenges, especially for steam engines. Everyone was in good spirits and had an amazing time! 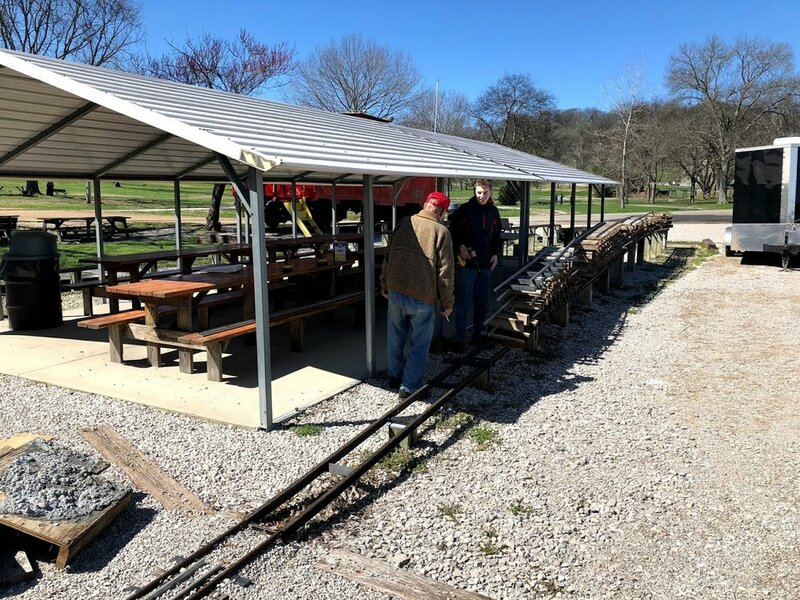 With the last workday being cancelled due to rain, a special workday was called to get the club back on schedule with spring meet preparations. 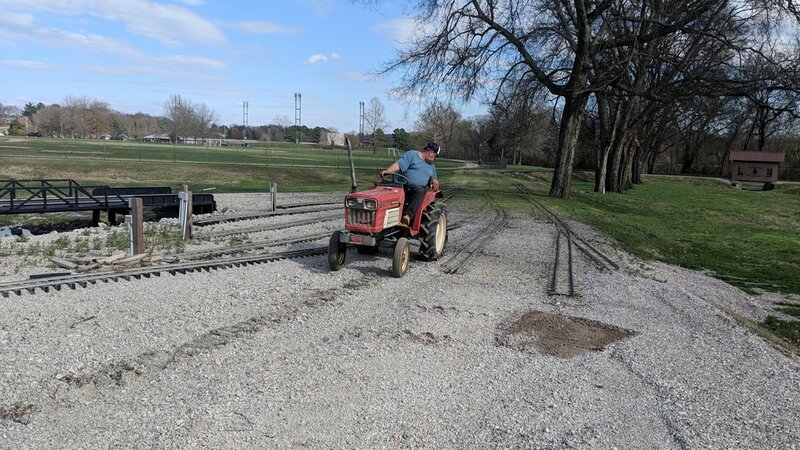 With the spring meet so close, it was all hands on deck to get a massive amount of gravel put down on the new tracks. Due to some great teamwork, the track crew was able to complete about 85% of the gravel work that was needed. Work will continue at the next workday this upcoming saturday. Crews were hard at work Saturday installing new lights for the Steaming Bay area. There is still more work to complete before the system is fully ready for the meet but good progress was made! 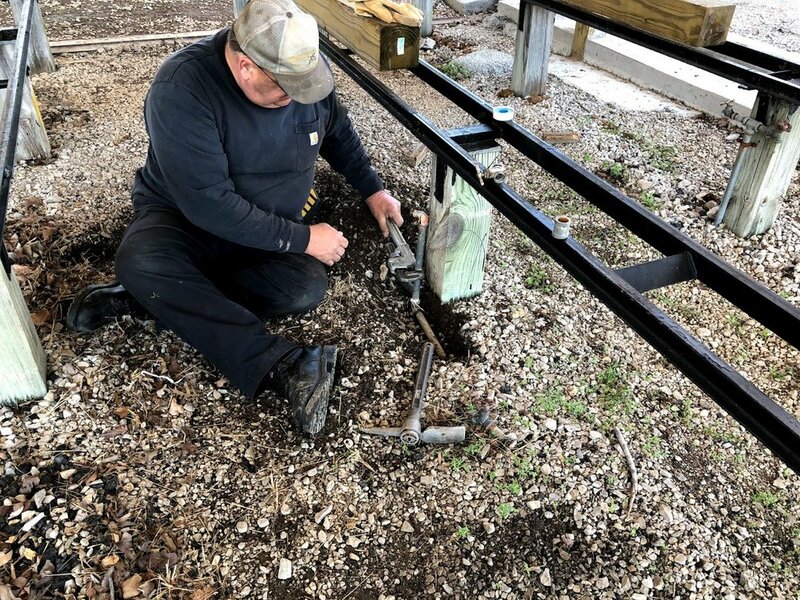 The Spring Meet is rapidly approaching and there are several projects being worked on simultaneously to get the facility ready for everyone's enjoyment. 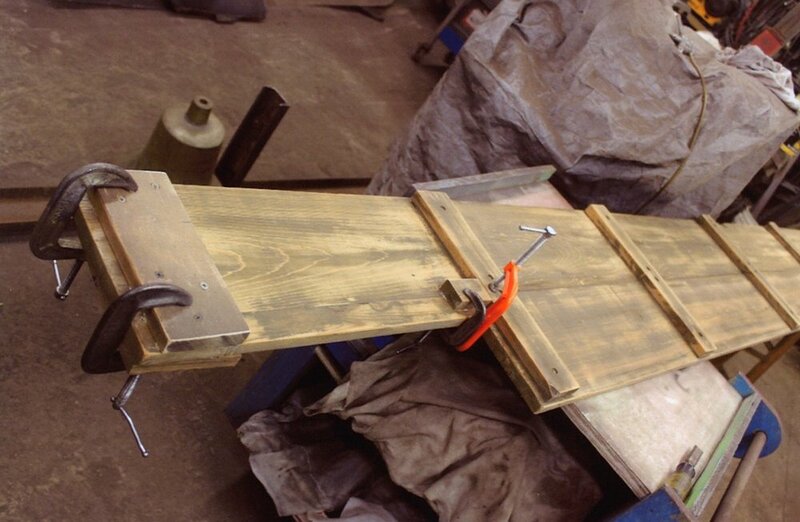 Mike Bassham has been working hard on two projects involving the steaming bay over the last few months. 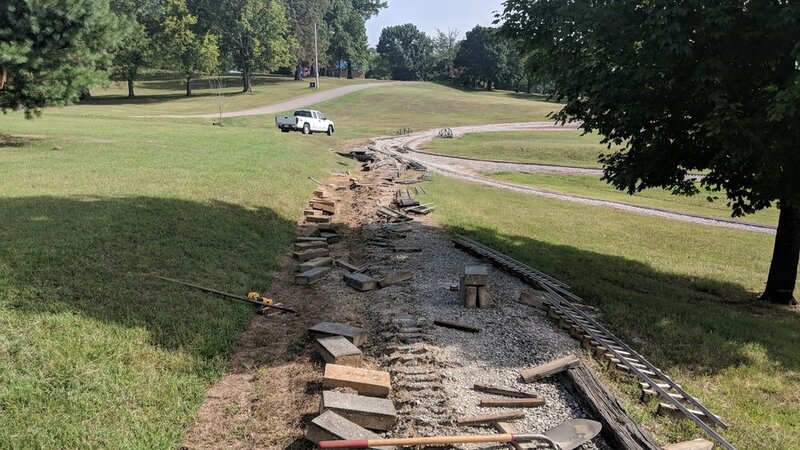 Project #1 was the removal of the wooden retaining wall around the bays and the installation of a new a concrete wall. Project #2 was the complete re-flooring of the entire steaming bay area. 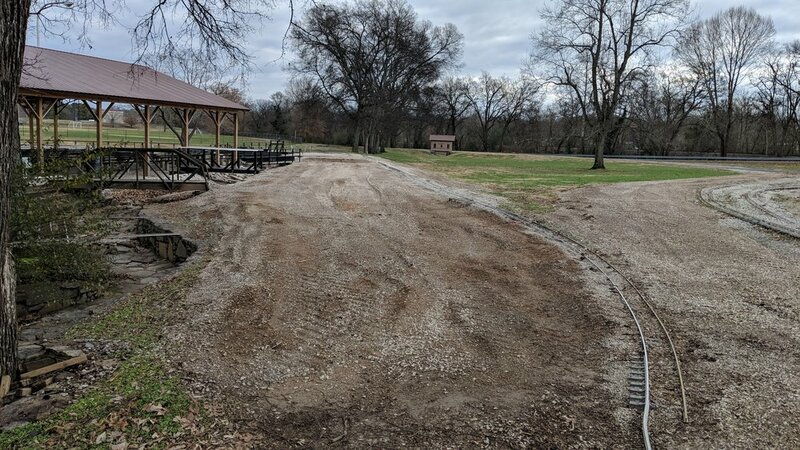 The old gravel and debris was removed and the entire area got a level coat of new gravel. Note, there is a lot of rock dust on the tracks but that will be cleaned before the meet. 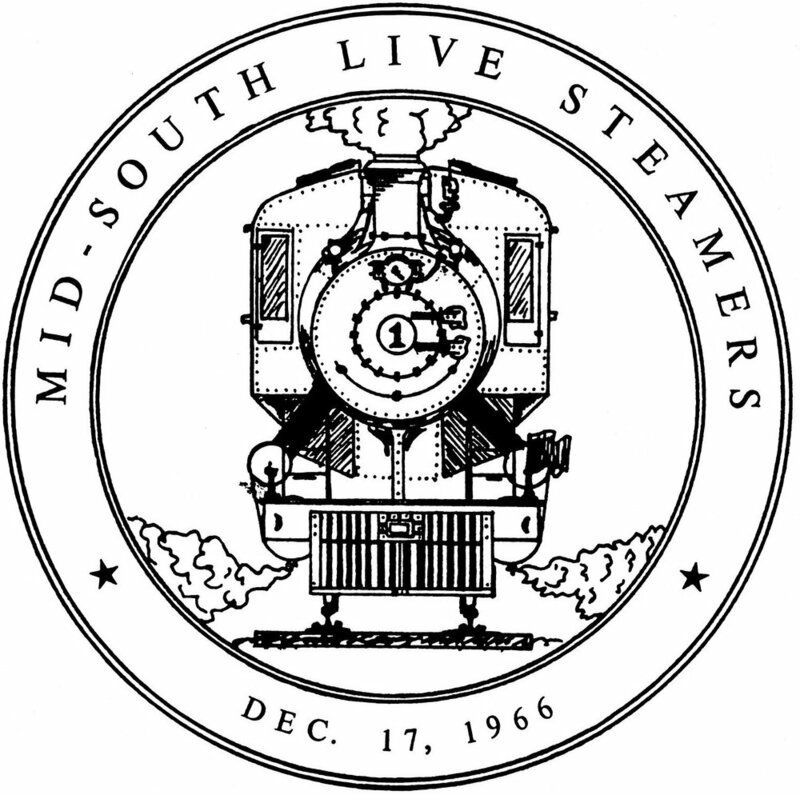 During the last meet, the club asked Ted and John Norcross if they could take the Mid-South Live Steamers wooden sign back to their shops for a professional restoration. The sign was originally displayed on the turntable in the steaming bay and was moved to the side of the storage building at some point during the 1990s. The sign was beginning to show signs of damage from all the years outside in the elements. From the photos below, you can see the dramatic transformation of the sign back to its former glory. Many thanks to the Ted and John for all their hard work on this project. The newly restored sign will be reinstalled on the storage building during the Spring Meet. With the Spring Meet on two months away, the track crew was hard at work getting the facility ready. The inner most track leading to the passenger station had seen over a decade of very heavy use and was in need of replacment . 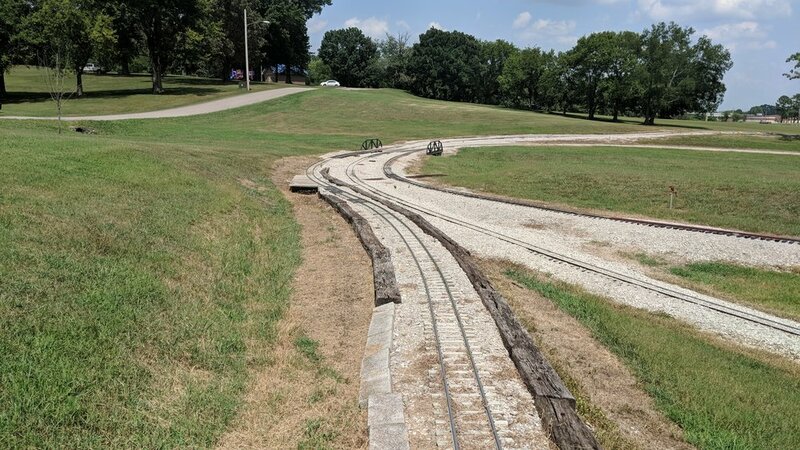 The entire loop was removed, roadbed leveled, and new track panels were installed. Additionally, several other members were around the facility taking apart old panels and repairing various issues that had been observed.